Voice disorder can affect anyone in life. This may prevent you from carrying out your normal day-to-day life and may lead to loss of earning in some people. A professional voice user includes anyone who relies significantly on his or her voice to earn a leaving. This may be a singer, schoolteacher, an instructor, news broadcaster, sales person etc. This group of people are most affected by voice disorders. Voice is generated from the voice box, which contains two cords-like structures call vocal cords. Although the vocal cords look like two simple cords that vibrates it has an extremely delicate and complex anatomic structure. 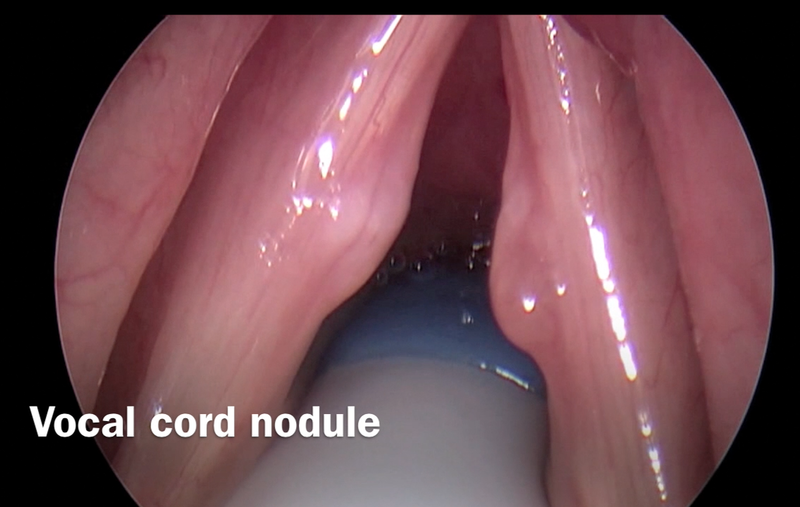 Phono-Microlaryngoscopy and removal of vocal cord nodule under a general anaesthesia. 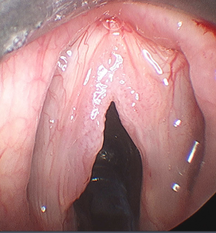 Right vocal cord polyp being examined during a microlaryngoscopy under a general anaesthesia. The vocal cords are two cord-like structures covered by mucous membrane. They are located in the larynx. The mechanism of voice production is complex. Sound is normally generated as air from the lungs passes up between the two vocal cords. The recurrent laryngeal nerve helps to move the vocal cords apart during breathing and brings them together during speaking or singing. The nerves supply to the vocal cords are call the recurrent laryngeal nerves. These nerves are call re-current because the passed the larynx and reaches the chest before coming back to supply the vocal cords. The reasons lies in the the embryological development when the heart and lungs develops along side the voice box high up in the neck but the lungs and heart drag the nerve with it as the nerve is hooked around the major blood vessel of the heart the aorta. These are thickened basement membrane with epithelial hyperplasia, analogous to callous. They are also called singer’s nodules because they are more common in singers. These are epithelial lined sac in the lamina propia with no capillaries. They can be caused by reflux, smoking, vocal trauma, infection and sometimes no apparent cause can be found. There are usually removed through a microlaryngoscopy procedure using a microscope and laser or micro-scissors. These are excess laminar propria with tissue-expansion of epithelium with glue in the Reinkes space. 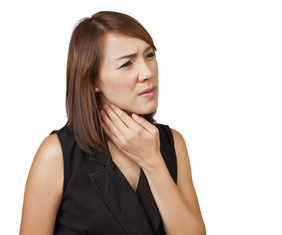 The symptoms are hoarse voice. These are hyper vascular with reparative inflammation and fibrosis. There are usually due to reflux or trauma or from prolonged intubation. They are treated by antireflux medication and Microlaryngeal surgery. These are fibrovascular strands with koilocytic cellular changes. It is usually due to human papilloma virus. 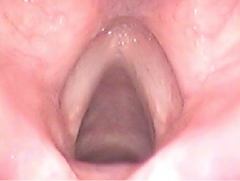 It is removed by micro laryngeal surgery using microdebrider or laser or coblation technique. It does come back requiring multiple surgery until the body immune system finally mounts enough antibody to control the disease. Medical treatment with antiviral drugs and gamma interferon have been tried but the results have not been promising. There is a small risk that some papillomas can go on to develop into cancer. These are white patches on the vocal cords due to damage to the epithelial lining of the vocal cords from smoking and acid reflux. They can progress into cancer of the vocal cords if the underlying cause is not treated. Vocal cord paralysis can be due to viral infection, neck trauma, neck or chest surgery, lung cancer, thyroid cancer or thyroid surgery. The symptoms are hoarseness, shortness of breath, cough, choking and aspiration pneumonia. The treatment is by speech therapy and vocal cord medialisation using injection technique or thyroplasty implant. An ageing voice is a condition called presbyphonia. The vocal cord losses its elasticity and collagen bulkiness gradually with age similar to the mechanism in skin wrinkles formation. This will then result into loss of power and loudness to voice. The voice might even sound breathy and weak. The onset of this changes is usually after the age of 50 but it can start quite early on just like the eye and hearing might start deteriorating very early in some people. This is usually diagnosed by history taking and a simple endoscopic examination of the voice box in the clinic. Once the diagnoses is made, the first treatment is usually voice exercise with the help of a speech therapist. In some cases, an injection of fat, Calcium gel, hyaluronic acid or collagen might be necessary to restore the bulkiness of the vocal cords. This injection might be repeated if needed. Mr Yakubu Karagama. Official main offices are located at BMI Alexandra Hospital, Cheadle, Stockport, SK8 2PX. Copyright © 2014-15. All Rights Reserved.